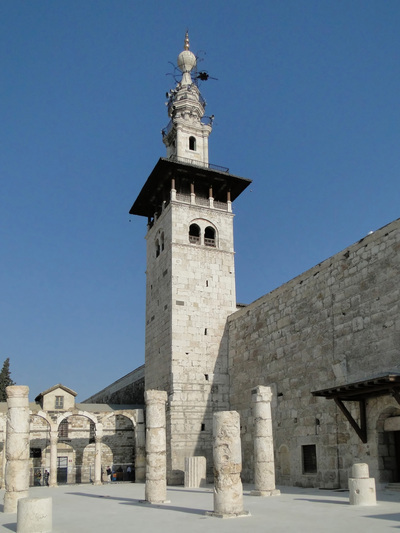 Minaret of the Bride, the Umayyad Mosque, 7th-8th c. CE, Damascus -- Photograph 2010 Via Wikimedia Commons. In a recent Wall Street Journal column, Fouad Ajami laments America's abdication of Syria as the country slides ever deeper into the morass of a bloody civil war. Ajami is the pre-eminent Arab-American academic and public intellectual writing about the contemporary Middle East. His realism, honesty, insight of the Arab world and elegant style, make him one of the most widely read scholars on the twists and turns of Levantine politics. But Ajami is at a loss to explain America's abandonment of a Syria traumatized by the sheer ruthlessness of Bashar al-Assad. Ajami knows better than just about anyone how well the current butcher of Damascus absorbed the lessons taught by Hafez al-Assad — Bashar's father and the man responsible for ordering the massacre of the population in Hama in February 1982. It is also undeniable that the current situation in Syria is not an anomaly by Arab standards. It is only the latest act in an old drama, of wily despots maintaining their hold on power by breaking heads until their luck runs out and the cycle is repeated. Ajami is, however, appalled by the inaction of the Obama administration as are others in the Middle East — the Syrian opposition, the Turks, leaders of the Gulf states, Arabs on the street, and just about everyone witnessing the daily carnage inside Syria. For once, Ajami has it wrong. The inaction of the Obama administration is a reflection of American opinion to stay distant from the interminable conflicts of the Middle East. American opinion is right on Syria. This is the natural and logical response of a people after having reflected on the lesson learned from their involvement in Afghanistan and Iraq. Saddam Hussein was worse, if this could now be imagined or explained, than the Syrian despot. His removal was earnestly desired by most Iraqis. Yet when Saddam Hussein was removed, the Arab-Muslim world in unison denounced the American liberators of Iraq for meddling in Arab affairs, and then held them responsible for the terror unleashed by Islamists against Iraqis. It was an Orwellian turn of logic. American soldiers were turned into criminals while criminal thugs from across the Arab world, swarming into a post-Saddam, free Iraq to cripple it with their wanton and indiscriminate terror, were turned into freedom fighters. It was even worse to follow the liberal-left opinion in the West – led by such disgusting demagogues as George Galloway, Noam Chomsky, the late Edward Said, and including then senator Obama, all posing as men of virtue — piling up on George W. Bush, while Arabs murdered Arabs in the manner in which they have done such killing going all the way back to the massacre of the Prophet's family. The lesson I learned from the experience in Iraq is simple: There is nothing good that can be done by outsiders for Arabs and Muslims. It is for them to sort out how eventually, if at all, they will jettison their appallingly dysfunctional tribal culture and acquire the modern culture of freedom and democracy. In the meantime, however long it takes, the right thing to do is distance the West from the Arab-Muslim world, its dysfunctional culture and its imported effects.